A multicenter, non-interventional extension study to understand the long-term efficacy and safety of anti-VEGF treatments on SCORE2 participants who completed the 12 month parent study. 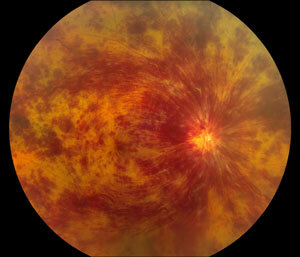 Phase 3 study of the efficacy and safety of ranibizumab (Lucentis) compared to sham injection in Branch Retinal Vein Occlusions. Phase 3 study of the safety, tolerability and biological effect of aflibercept (Eylea) for Central Retinal Vein Occlusions. Phase 3 study of the efficacy and safety of ranibizumab (Lucentis) compared to sham injection in Central Retinal Vein Occlusions. Phase 3 study of the efficacy of the Dexamethasone Intravitreal Implant (Ozurdex) in Retinal Vein Occlusions. Phase 1 open label dose escalation study of the safety and tolerability of a sustained release Intravitreal Liquid Drug Delivery using Triamcinolone Acetonide. A 1 year Prospective study of Aflibercept (Eylea) for previously treated Macular Edema associated with Central Retinal Vein Occlusion. A phase 3, 12 month, randomized, masked controlled trial to study the safety and efficacy of suprachoroidal CLS-TA in conjunction with intravitreal aflibercept in subjects with retinal vein occlusion. A 1 year study of comparative treatment between bevacizumab (Avastin) and aflibercept (Eylea) for Retinal Vein Occlusion. Phase 4 study evaluating different dosing regimens of ranibizumab (Lucentis). A 1 year, Phase 3 study of the efficacy, safety and tolerability of aflibercept (Eylea) compared to Laser for the treatment of Branch Retinal Vein Occlusion.